The OE, or "original equipment," components in a new transmission are always carefully designed and installed with the intent to last for tens or even hundreds of thousands of miles on the road. In order to do the best transmission rebuilds you can, you want to be able to guarantee that your work can perform just as well, and for as long, as a brand new unit. Here's the catch: you can only make that kind of promise if you're rebuilding with OE components — that is, rebuilding it with the parts that built it. Many aftermarket brands make deceptive claims about the OE nature of their parts. 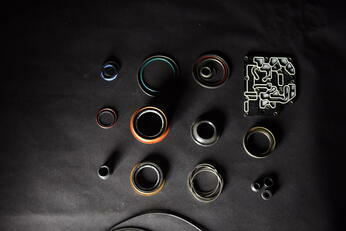 After all, it's in their best interest to represent their parts as being "as good as" OE components. They might even want to let you believe they're the OEM (original equipment manufacturer) when they're not. At the end of the day, "OE" isn't simply any match for the original part; it is the original part that was installed into the new unit, and therefore, is held to the same standard of quality. However, true OE components can be harder to spot than you'd think. In this post, we'll explain what it means to be OE in the transmission industry and give you a peek into how OE is represented in today's transmission aftermarket. It's the exact part that's installed in the original unit. In order to truly be considered OE, a component must be the exact same as the one installed into the transmission when it's built. All new units contain OE parts. In the aftermarket, however, a reproduction part isn't going to cut in. Any substitute part is not OE. Only the same part that's used on the assembly line can be considered OE. It's made by the original manufacturer. Along the same lines, a component can only be considered OE if it comes from the actual OEM. While other aftermarket brands can and will attempt to create their own versions of the OE part, often with a certain degree of accuracy, those reproductions cannot be considered to be truly OE and will not perform as such. OE components are tooled, produced, and sourced only by the original equipment manufacturer. It's made from the same materials as the original part. One of the reasons OE parts perform to a much higher caliber than reproduction or aftermarket components is due to the innovative materials used to create the component. As opposed to bargain aftermarket options that are often made of cheap and easily attainable raw materials, OEMs put a huge amount of research and resources into developing materials that will allow their parts to actually stand up to wear and tear inside the unit. A similar aftermarket part that's made of lower-quality materials cannot be considered OE, as it's not made to the same specifications as the original part. When you're in the position to purchase the transmission rebuild kits for your shop, aftermarket parts masquerading as "OE-quality" or "OE-equivalent" are something to be wary of. While these parts might work in a pinch, you have no way to guarantee their quality or durability; simply, the more non-OE parts you use in your rebuild, the more risk of failure and comebacks you take on. These reproduction parts aren't built to the same standards as the actual OE components. 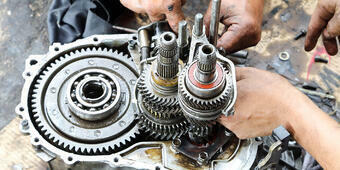 On the market today, most of what you'll find inside transmission overhaul kits is not OE. Instead, you might be paying a little less for far lower-quality parts than you're taking out of the unit. With those kits, you're replacing the original parts, designed for performance, with cheaper knock-offs and alternatives. Instead, save your shop from the threat of costly comebacks with an overhaul kit that's filled with as much OE content as possible. Only kit suppliers with actual ties to OEMs have access to these components, so it's important to investigate any aftermarket brand's claims about the origins of their components. By asking a few pointed questions and reading up on the aftermarket brands you're using, you should be able to find out what parts actually come from the OEM with a high level of transparency. When it comes to ensuring you can rebuild it right every single time, your investment in brands that supply true OE content will always be worthwhile.